Number of championships: La Liga – 10 times; Segunda División – 1 time. Number of Cup wins: Copa del Rey – 10 times; Supercopa de España – 2 times; Copa de los Campeones de España – 1 time; Copa Presidente FEF – 1 time; Copa Eva Duarte – 1 time; European Cup Winners Cup – 1 time; UEFA Super Cup – 2 times; Intercontinental Cup – 1 time. * Book Official Atletico Madrid Tickets Now! * Atletico Madrid Tickets Have High Demand, Don't Miss The Opportunity. * Atletico Madrid Tickets Are 100% Guaranteed. Atlético Madrid football club, more commonly known as Real Madrid, are a professional football club based in Madrid, Spain. They are most famous for their presence in the La Liga and Champions League and being one of the most successful and popular teams in the world. Atlético Madrid was founded in 1903 as Athletic Club de Madrid, by Basque students living in Madrid, with the intent of making it a youth branch of Athletic Bilbao. In 1921, it became independent of Athletic Bilbao, and became Atlético Madrid as we know it today. That same year, Atlético Madrid won the regional championship for the first time and were a runner-up for the Copa del Rey - a huge achievement for a team in their infancy. However, things went downhill during the 1920s and 1930s, when the team were repeatedly relegated to the Segunda División (Second Division) and returned to the Primera División (First Division). After the Civil War, the club merged with Aviación Nacional, a club founded by the Spanish Air Force in 1939. The team won the Primera División in 1939-40 and once again 1940-41; and again in 1949-50 and 1950-51. During the 1960s and 1970s, the team faced tough competition from Real Madrid, but still managed to win La Liga several times, as well as the Copa del Rey on some occasions. However, the late 1970s until the mid-eighties were a dry period for the team. In 1984-85 the team won the Copa del Rey, and the Spanish Super Cup the following season; it won the Copa del Rey twice more in 1990-91 and 1991-92. The team gained another victory as it won both the Spanish Cup and the Copa del Rey in 1995-96. Unfortunately, the next several years were marked by turmoil as club president Jésus Gil y Gil and board members were suspended due to a financial investigation; the club's performance plummeted, and it was relegated to the Segunda División, where it spent two seasons until 2002. Several years passed before the team's fortune changed, first under Quique Flores and then under Diego Simeone in 2011. The team won the UEFA Europa League in 2009-10 and 2011-12; the UEFA Super Cup in 2010 and 2012; the Copa del Rey in 2013-13; the Super Copa de España in 2014; and both La Liga and the UEFA Champions League in 2013-14. What is Atlético Madrid's Most Successful Period? 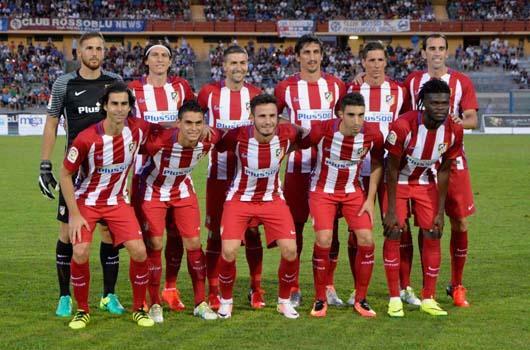 Atlético Madrid's best run since the club was founded in 1903, is 2012-13. The team won the Copa del Rey as well as the UEFA Super Cup. Choose an Atlético Madrid game from the upcoming events at the top of the page. Choose your desired seating section. Click how many tickets you would like. Choose your delivery address and add any specific details. Either create an account or log in with an existing account. Check the "I agree to the terms and conditions" box. Choose a payment method and confirm your Atlético Madrid ticket purchase. Wait for a confirmation email in your email address. Enjoy your Atlético Madrid's tickets!